Wafer thin painted wood - framed and wall mounted. The common Footman Moth is becoming extinct. 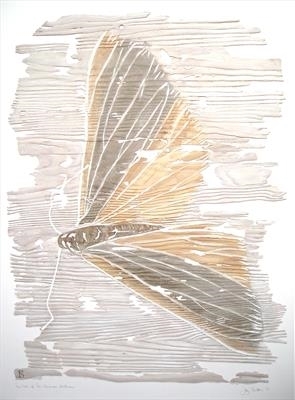 A orange and brown moth painted with pigment on fine grainy wood, framed and wall mounted. Fragile and delicate similar to a moth's wings, the wood is sanded finely till it frays at the sides and becomes papery.